Vestiges is the first volume in Laurence Suhner’s QuanTika trilogy. Although Suhner writes in French, I was able to find an English translation of at least this first volume. Having failed to terraform Mars, humanity transfers its colonizing enthusiasm to the nearby AltaMira system. Only six and a half light years from the Solar System, AltaMira is within reach of sub-light starships. Like the Solar System, it has an Earth-like world with a breathable atmosphere in the double star’s habitable zone. More or less. The “or less” is thanks to an eccentric orbit that dooms the world to snowball status for most of its year. It is also the site of humanity’s first contact with an alien civilization — or rather, the relics of one. A structure dubbed the Great Arch orbits Gemma and is clearly artificial. It is also seemingly inert and impenetrable. Its secrets have been well hidden. That is about to change. The Archea mission’s ostensible purpose is look for signs of primitive life on Gemma. Visionary scientist Ambre Pasquier has misled her team; the actual purpose of the expedition is to look for alien secrets that Ambre is convinced are hiding beneath Gemma’s ice. Lying to her fellow scientists serves two purposes: it solves some security issues and it allows Ambre to avoid answering questions about how she knows what is under the ice. Ambre’s security was not good enough. As result, xenologist Seth Tranktak has made a deal with an ambitious oligarch and the local militia. They will stage a quiet military coup, providing Seth with access to the secrets under the ice. In return, Seth has promised his foolish allies access to advanced technology that will no doubt facilitate weapons no other power can match. Why not? It is what the militia wants to hear and perhaps it’s even true. Actually, neither Ambre nor Seth have any idea what’s hidden under the ice. Seth promised a weapon. What he may deliver is annihilation on an epic scale. AltaMira is a fictional nearby star system, designed with physical characteristics that suit Suhner’s purposes. Reading this translation was not always easy. I had the sense that some phrases were translated a bit too literally and others incorrectly. Still, this was a far better translation than most of the scanlations I’ve read. Some readers might ask if this is a hard-SF novel. There are at least two correct answers. The first: it’s not clear that it is, but hard-SFness cannot be ruled out at this time. The first volume in the series, Vestiges, is more concerned with establishing mood and mysteries and less concerned with satisfying nitpicking readers like me. That said, while the ultimate explanations may baffle human comprehension, one has a sense that there are explanations. .
A second: definitely yes, considering what else has been called hard SF. If settings with faster than light travel, psionics, and absurdly rigid worlds can be embraced as hard SF, then this must be as well, The author deviates from the norms of hard SF only in that she is a woman. While there are inexplicables (the curious manner in which space-time behaves in certain locations on Gemma, what seems to be a bridge between worlds or eras), Suhner has put enough thought into the setting that most of it rings true. Her takes on orbital mechanics, planetology, climate, and ecology worked for me. Which is high praise, from me. The book raises one SF-fundamental issue: can humans really understand aliens? Could we manage to communicate, if we encountered an actual living alien with whom we could attempt to converse1? Although these questions are not fully resolved within the confines of the novel, what we do learn is that a far more pressing question might have been: is it prudent to bridge the gulf between human and alien? Possibly not. But as is so often the case, questions like “should I pet this angry dog?” and “is it a good idea to strike a spark within this cloud of flammable vapor?” can only be answered if one performs the experiment. Caveat: the book is the set-up for a three book mystery written in a language I do not speak or read. Unless some Anglospheric publisher can be convinced to purchase the rights and translate the work, I may never find out who the mysterious Builders were, what sealed-evil-in-a-can they have hidden, and whether anyone survived after the can was opened. Something I regret, which may suggest that if this book gave me an itch for completion, the trilogy might sell2. Hint hint. 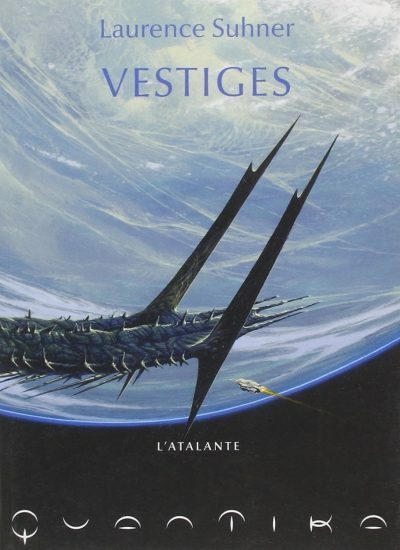 Vestiges is available (in French) here (Amazon) and here (Chapters-Indigo). 2: I have discovered a second work by the author, one that has been translated into English. Calloo callay, oh frabjous day!